i had taken the camara a part (the back half) the check the flex in well conected and all looked good but still white sreen. then i found this post and just knock it a little and to my surprise it worked. big thanks. Nice tapping didn't work, but when I tapped harder, it just start working! Amazing tip! Unbelievable, but does work!!! Thanks folks! 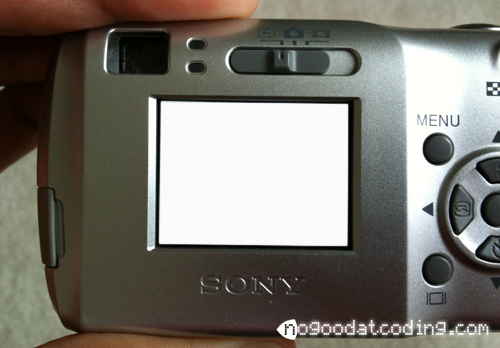 I needed to take an urgent photo and found a blank white screen when I turned on my Sony DSC-S40. All set to buy another camera I tried the internet "just in case". A Google search and one punch later my camera worked again. I thought it was a joke too! Thanks alot for posting such a useful tip, it worked!! I had even opened the camera, put it back together and didn't work. Now I hit it with my knuckles in the logo and it worked! Great post, thanks so much, it did the trick! Thank you so much - worked for me too! Unbelievable - such a simple fix! 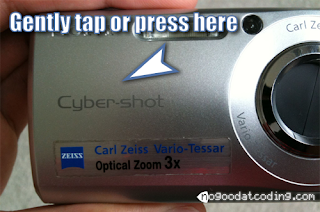 IAN says: I went to buy a used Sony DSC-S40 at a Cash Converter location. Turned on a Sony DSC-S40 camera and it had a white screen. The salesperson said I could buy it for $5.00. So I bought it. ITS FIXED NOW. GREAT TIP. MUCH THANKS. SEPT.04 2014.
, it worked for awhile and then I got the white screen. Gave it a rap as instructed here. Works perfectly now. Wow!! !